The invasion lasted a month. It was the same scene morning after morning, glittering slug trails all over my living room, covering the furniture, the tile floor, and the glass window panes on my French doors. Cleaning up slug slime quickly became my least favorite chore of all. Of course, all the kids would disappear as soon as I came out with the bucket of cleaning supplies. No one volunteered or stayed around long enough to be enlisted with helping wipe away the dried-up goo from my living room. I can’t tell you the hours the kids and I spent searching diligently for the offending slug, sometimes finding it slowly moving through out living space. Other days, the slug was nowhere to be scene, but we knew it had been there because of the shiny evidence marking it’s path through the house. I never could figure out what started the infestation. Where were the slugs coming from? What were they trying to escape? And what were they hoping to find in my house? The answers to these questions eluded me. As the problem began to drag on, I became a diligent researcher, hoping to find a method to rid my life of slugs. Truthfully, I didn’t learn anything really helpful. The invaders finally left, and I never did figure out what it was that caused them to seek out a new place to roam. However, through my research, I did happen upon a lot of fascinating information about these gross mollusks. For example, did you know the slime was actually part of a slug’s self-protection? The thick layer of slime prevents the slug from being hurt by twigs, rocks and other sharp objects in its path. 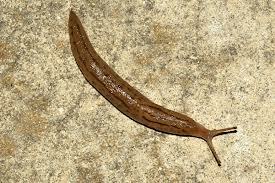 In fact, a slug can slide right over a sharp razor blade without receiving any injury whatsoever! Pretty amazing. Slug slime also serves as a way for these creatures to find their way back home after a night of foraging for food. Other slugs can use slime trails to aid in finding sources of food. And those slicky, slimy slug bodies enable the little critters to stretch, up to twenty times the normal body length, meaning slugs can squeeze through extremely tight spaces. All of this information helped me to see that to a slug, slime is a necessity of life. Without it, they couldn’t exist. Even after learning so much about slime trails, I still wasn’t really a slug fan. But then God used these rather yucky garden pests to remind me of one of His truths. I could tell exactly where the slugs had been inside my home because they left behind a glittery, shiny trail for me to see. The slime, so necessary to their way of life, is what enabled me to follow their movements in my home. Are you leaving an evidence trail to lead others to Me? Thankfully, the slug invasion ended, and I no longer had to wake up to face a morning of cleaning up slimy goo. But now, each time I see a slug or notice a shiny slug trail on a sidewalk, I am reminded to ask myself if I am leaving behind an evidence trail that will lead others to Christ. S is for slugs … and the lesson to be more like them in the way I live my life. What a beautiful post! Fascinating information, and I love that you were able to grow spiritually from something so mundane. Wonderful!